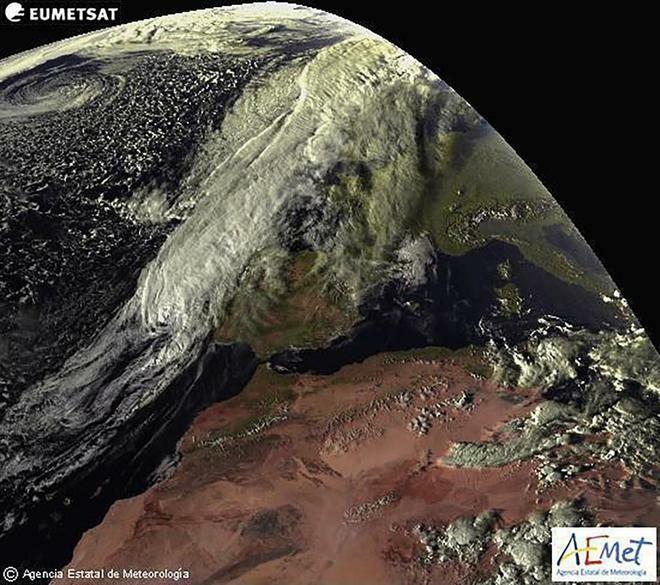 Hurricane Leslie, already a tropical storm, has left in the first hours of its entry into peninsular Spain wind gusts of up to 96 kilometers an hour located this morning in the province of Zamora, according to data from the State Meteorological Agency. The highest wind speed caused by this adverse weather phenomenon has been registered in the Zamorano municipality of Fuentesaúco , east of the province, where at 3:20 this Saturday the maximum wind gusts of 96 km / h have been reached. In the province of Zamora, as a result of Tropical Storm Leslie have also recorded gusts of wind of 87 kilometers an hour in Villardeciervos , in the Sanabria region, located in the northwest of the province. The wind has reached this morning its maximum constant speed of Spain in the Zamora localities of Fuentesaúco and Villadepera, with speeds of 68 and 57 kilometers an hour, respectively. Civil Protection has recommended to the citizens to keep at all times attentive to the notices issued by the State Meteorological Agency and the different Administrations. Throughout the morning, according to the Aemet, the cyclone is expected to weaken considerably as it moves northeast, joining other centers of low pressure. The presence of the remains of the cyclone, with very active fronts that will travel the peninsula from west to east and on the northeast of the peninsula, will lead to widespread precipitation that will be more intense in Asturias, León and Cantabria . Civil Protection advises drivers to slow down, take precautions and do not stop in areas where a large amount of water can flow. Faced with strong winds in urban centers, remember also the convenience of closing doors, windows and all those objects that may fall on public roads , as well as away from cornices, trees, walls or buildings under construction that can be detached. The State Agency of Meteorology (Aemet) has deactivated the yellow level warnings in the early hours of this Sunday due to the risk of storms linked to tropical cyclone 'Leslie'. In this way, according to the Aemet informs on its website after 8.00 am on Sunday, in Andalusia yellow level alerts remain active in the provinces of Cordoba, Granada, Malaga, Jaen and Almeria . For its part, the Emergency 112 Andalusia service has managed a score of incidents related to wind and rain from 0.00 to 6.00 hours this Sunday in the whole of the autonomous community, although none of them has been relevant and There are no personal injuries, as reported by the device from their accounts on social networks. The storm was moving away from Portugal where it left 176 km / h winds uprooting trees and leaving hundreds of thousands of homes without electricity. The hurricane, which roamed the Atlantic Ocean since September 23 , was degraded to a post-tropical storm in the early hours of Sunday. Much of the country was on red alert. "At the moment it is a post-tropical storm and is already in the extreme north of the country, where it will continue to rain, but the situation will quickly return to normal, " he said at 02:00 local time (01.00 GMT) the president of the institute of Portuguese meteorology, Jorge Miranda, to the Portuguese press. Hundreds of thousands of people were deprived of electricity and several dozen had to leave their homes. The regions most affected were Lisbon, Leiria and Coimbra (center), where most of the incidents were due to falling trees, damage to roofs or small floods.
" I had never seen anything like this before: the city ​​seemed to be in a state of war, with vehicles crushed by the fallen trees," an inhabitant of Figueira da Foz, some 200 km north of Lisbon, told SIC television.